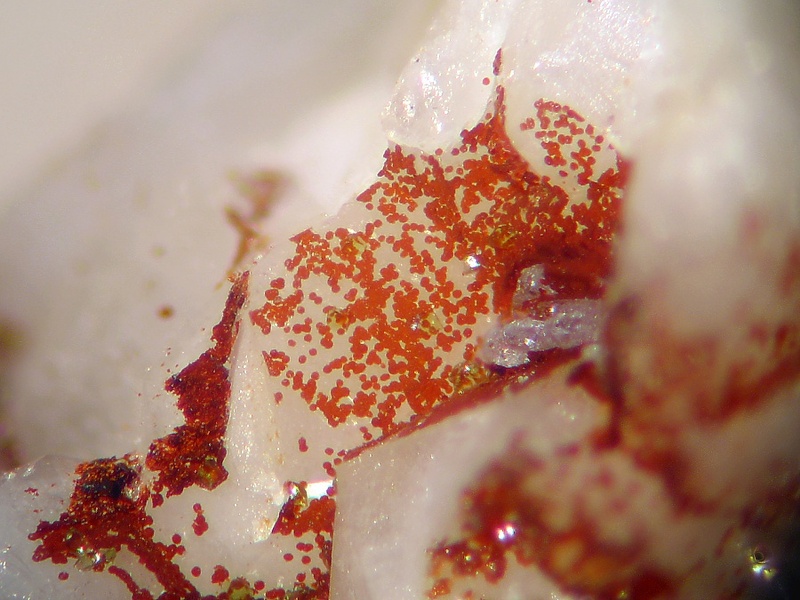 Ferrihydrite: Mineral information, data and localities. For the chemical composition (hydrated ferric iron oxide). A poorly crystalline nanomineral built up of about 20% (FeO4) and 80% (FeO6) polyhedra. It forms by rapid oxidation and hydrolysis, and exists in varying degrees of structure disorder; the two extremes are the so-called 2-line and 6-line ferrihydrites (distinguished by their X-ray powder diffraction patterns). It is a metastable nanomineral precursor to other minerals, e.g. hematite, goethite. There are no known deposits of ferrihydrite before the Pleistocene. Two structure models have been proposed: the "f-phase" model and the "akdalaite" model; the first one seems to be correct (Paktunc et al., 2013). Some lichen (e.g., Pertusaria corallina, Stereocaulon vulcani) may induce ferrihydrite formation on lava flows and basalt- and gabbro- hosted olivine and also on augite (vide Burford et al., 2003). The iron bacteria, especially Gallionella ferruginea, Leptothrix ochracea and Toxothrix trichogenes create ferrihydrite as a waste product of their metabolism. Dussertite 1 photo of Ferrihydrite associated with Dussertite on mindat.org. Anglesite 1 photo of Ferrihydrite associated with Anglesite on mindat.org. 4.3.2.1 Akdalaite 5Al2O3 · H2O Hex. Izvestiya Akademii nauk SSSR (1973): (4): 23-33. Clays and Clay Minerals: 36: 111-124. Paktunc, D., Manceau, A., Dutrizac, J. (2013): Incorporation of Ge in ferrihydrite: Implications for the structure of ferrihydrite. American Mineralogist, 98, 848-858. Greshake, A. (1997). The primitive matrix components of the unique carbonaceous chondrite Acfer 094: A TEM study. Geochimica et Cosmochimica Acta 61 (2): 437–452. (Jan 1997). ; Wasson, J. T. & Rubin, A. E. (2010). Matrix and whole-rock fractionations in the Acfer 094 type 3.0 ungrouped carbonaceous chondrite. Meteoritics & Planetary Science 45 (1): 73-90. (Jan 2010). Lartaud, F., Little, C. T., De Rafelis, M., Bayon, G., Dyment, J., Ildefonse, B., ... & Le Bris, N. (2011). Fossil evidence for serpentinization fluids fueling chemosynthetic assemblages. Proceedings of the National Academy of Sciences, 108(19), 7698-7703. D. J. Barber & R. Hutchinson (1991). The Bencubbin stony-iron meteorite breccia - Electron petrography, shock-history and affinities of a 'carbonaceous chondrite' clast. Meteoritics 26, 83-95. MONCUR , M.C, PTACEK, C.J., BLOWES, D.W. & PETERSON, R.C. (2015) The occurrence and implications of efflorescent sulfate minerals at the former Sherritt–Gordon Zn–Cu mine, Sherridon, Manitoba, Canada. Canadian Mineralogist Vol. 53, 961-977. Zhiwei Bao (2001): PhD Thesis, University of Québec, Canda. L. P. Keller & Peter R. Buseck (1990). Matrix mineralogy of the Lance CO3 carbonaceous chondrite - A transmission electron microscope study. Geochimica et Cosmochimica Acta, vol. 54, p. 1155-1163. (April 1990). Gautier, J, Grosbois, C., Courtin-Nomade, A., Floc'h, J. P. and Martin, F. (2006): Transformation of natural As-associated ferrihydrite downstream of a remediated mining site. Eur. J. Mineral. 18, 187-195. Kazushige Tomeoka & Peter R. Buseck (1988). Matrix mineralogy of the Orgueil CI carbonaceous chondrite. Geochimica et Cosmochimica Acta 52, #6, 1627-1640. (June 1988). 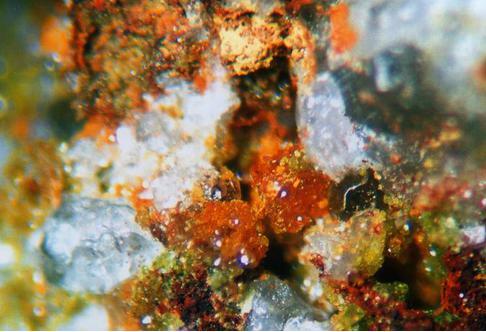 Nieding, E. (1990): Rezente Mineralbildungen in Schlacken der Schmiedestollenhalde in Wittichen/Schwarzwald. Aufschluss, 41, 361-364. Laurion The minerals in the ancient slags by Piet Gelaude netc. Lee, M.R., Hutchinson, R., and Graham, A.L. (1996) Aqueous alteration in the matrix of the Vigarano (CV3) carbonaceous chondrite. Meteoritics & Planetary Science 31, 4, 477-483; Tomeoka, K., and Tanimura, I. (2000) Phyllosilicate-rich chondrule rims in the Vigarano CV3 chondrite: Evidence for parent-body processes. Geochimica et Cosmochimica Acta, 64, 11, 1971–1988; Abreau, N. M., Brearley, A. J. (2011) Deciphering the nebular and asteroidal record in silicates and organic material in the matrix of the reduced CV3 chondrite Vigarano. Meteoritics & Planetary Science, 46, 2 (Feb. 2011), 252-274. Canet, C., Prol-Ledesma, R. M., Proenza, J. A., Rubio-Ramos, M. A., Forrest, M. J., Torres-Vera, M. A., & Rodríguez-Díaz, A. A. (2005). Mn–Ba–Hg mineralization at shallow submarine hydrothermal vents in bahía Concepción, Baja California Sur, México. Chemical Geology, 224(1-3), 96-112. R Moss 2000. GEOCHEMISTRY AND MINERALOGY OF GOLD IN THE PACMANUS AND SUSU KNOLLS HYDROTHERMAL SYSTEMS, EASTERN MANUS BASIN, PNG. Unpublished PhD thesis Univ of Toronto. Siuda, R. (2004) Wieściszowice. Otoczak, No.31, 58-65. Surour, A. A. (2015). Cu–Mn–Fe alloys and Mn-rich amphiboles in ancient copper slags from the Jabal Samran area, Saudi Arabia: With synopsis on chemistry of Fe–Mn (III) oxyhydroxides in alteration zones. Journal of African Earth Sciences, 101, 70-83. William B. White – Cave sediments and paleoclimate. Journal of Cave and Karst Studies, v. 69, no. 1, p. 76–93.